As much as I try to deny it, the cooler weather is here and winter is on the way. I’ve been wanting to design a new pair of fingerless gloves for a while now, so I guess there’s no better time. Fingerless gloves are my go to these days as I find I’m constantly needing my phone to check email, respond to texts and deal with business matters. These gloves help to keep a large portion of your hand warm while giving your fingers a little more freedom. Keep your hands cozy on a chilly day with these gloves. I’m calling this the “Elizabeth” fingerless glove pattern as this crochet pattern uses the Elizabeth stitch. You may remember that I created a stitch tutorial a couple of weeks ago showing you how to create this beautiful stitch – see the tutorial here. These fingerless gloves are quick to make, taking only a 2 -3 hours to complete.They are the perfect accessory to complete any outfit. With the holidays on the way, they also make a thoughtful handmade gift to give to your friends and family. 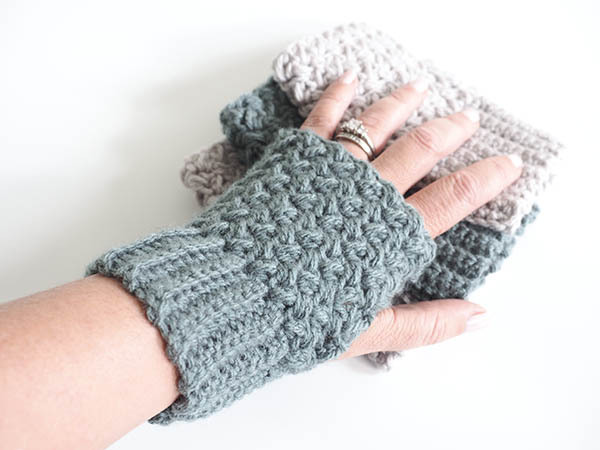 This Easy Elizabeth Stitch Fingerless Gloves Crochet pattern is also quite adaptable – experiment with different yarns and colors. We used Blue Sky Cotton yarn for these fingerless gloves. This is one of my favorite yarns right now. It comes in incredible colors and it’s so soft and pretty. It really does make for a perfect yarn for this project. Every kit includes the digital PDF pattern for the Fingerless gloves, plus all of the yarn you need to bring this project to life. Plus you can feel good about your purchase because you’re supporting a small business who is passionate about crochet. I love supporting other makers, and it’s great to be a part of such a supportive community. Pick up the kit and start creating some Fingerless gloves for gifts this holiday season. Click here to purchase an ad-free PDF of this pattern. For a limited time you’ll also get access to dozens of additional patterns, over 30+ Crochet and Knit classes, yarn discounts, access to expert instructors, a community and more. Light size 3 Weight Yarn – Get The Fingerless Gloves Kit Here. This crochet pattern is worked in two sections, the ribbed cuff and then secondly the hand portion. To finish it off, the sides are seamed together. 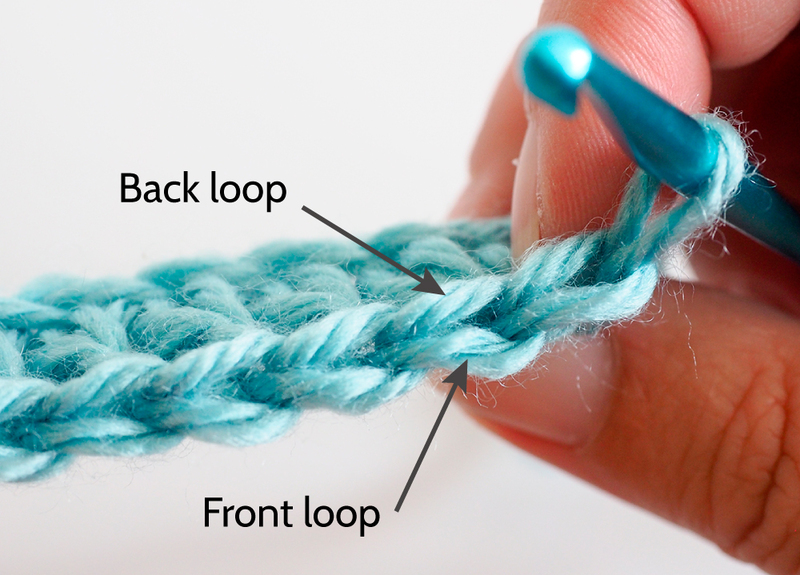 Insert your hook into next stitch, pull up a loop, yarn over, back into the same stitch and pull up another loop, yarn over and pull through all four loops on the hook. ch 1. Row 1: Starting in the 2nd chain from the hook, sc into each stitch until you reach the end of the row, turn. Row 2: Ch1, sc into the back loop in each stitch across the row, turn. (see photo below for help finding the back loop). Turn the ribbed cuff portion you’ve completed. You’ll now start crocheting along the long side of the section you just made. Row 1: 1 sc into the end of each row from the cuff, turn. Row 2: Ch3, 1 Elizabeth Stitch in every other stitch across the entire row, turn. Row 3: Ch3, 1 Elizabeth Stitch in every other stitch across the entire row, turn. across the entire row with the last stitch being worked under the turning chain, turn. Rows 4 – 12: Repeat the steps in Row 3. If you would like the gloves longer add additional rows. Fold in half and stitch together using the whip stitch, leaving a space for your thumb to go through (for me that was about 2.75” up for the edge of the cuff, leaving about 1.75” for the hole above and then stitch up the last 1”). For a more interesting look, add different colors of yarn as you work through the pattern. Hi, fell in love with the Elizabeth stitch. The gloves worked up so beautifully. Thank you! Love this pattern. It was easy for me as a beginner. After the first pair, I decided to add a row of SC to the transition between thre ribbed cuff and the Elizabeth stitch, and a final row of SC at the top and the result was a beautiful finished look. I also made the cuff area a little longer 16 sts) so it can either be turned as a cuff or worn longer to warm the arm.